This girl from a small town of Madhya Pradesh has created the history. 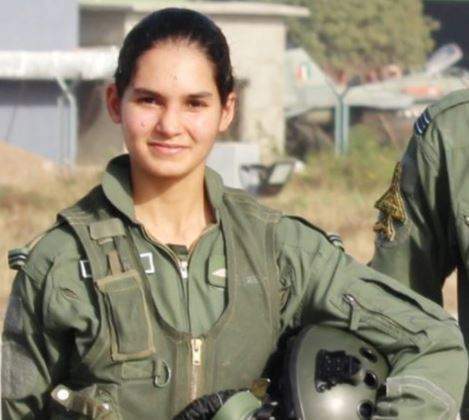 Avani Chaturvedi has become the first Indian woman pilot to fly solo that too MiG-21 Bison. Avani flew a MiG-21 bison in her first training solo sortie at Jamnagar, Gujarat. In the Russian-origin jet, she completed the half-an-hour long solo flight. On this achievement of Avani, AF spokesperson Wing Commander Anupam Banerjee said that this is a major milestone in training of a fighter pilot. It also showcases IAF’s enduring commitment to ‘Nari Shakti’. She was inducted into Indian Air Force fighter squadron on June 18, 2016. She is from the first batch of three women officers commissioned as fighter pilots. It was trio of Avani Chaturvedi, Bhawana Kanth and Mohana Singh out of which Avani became the first to successfully solo sortie of fighter plane. Avani Chaturvedi who is posted to No. 23 Squadron (Panthers) had undergone several training since June 2016. She completed her basic flying training on a Pilatus aircraft at the Air Force Academy then underwent six months of training on Kiran trainer. After this, a year-long training stint on Hawk advanced trainer jets at Bidar Air Base. She had undertaken flights in twin-seater training jets. In October 2015, Indian Government decided to open the fighter stream for women. But these are still not available to women in the Army and the Navy.